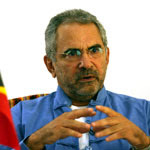 The Australian government is pleased that Jose Ramos Horta is the new president of Timor Leste. They seem to think he is a moderate. The Communist Party of Australia seems to think differently. East Timor’s President José Ramos Horta again last week praised the humanitarian assistance his people are receiving from Cuba in the fields of medicine and education. After pointing out that he had requested support from the governments of Australia, Indonesia and the Philippines to carry out development programs, he highlighted Cuba’s selfless assistance. That collaboration will allow upgrading medicine in East Timor to a First World level by training doctors in Cuba, he said. Over the past three years, a 350-strong Cuban medical brigade, made up of physicians and technicians, has been working in East Timor as well as teaching young doctors. In addition, 500 East Timorese youths are studying medicine in Cuba, as part of a Cuban government-sponsored program that will allow East Timor to meet its public health needs by 2012. Professors from Cuba are also contributing to the country’s literacy campaign by implementing the Cuban teaching method "Yo Si Puedo" (Yes, I Can). In a previous meeting, Ramos Horta had said, "I thank Commander Fidel Castro for his leadership and his vision, which shows that, although our countries are distant, East Timor has always been one of his priorities in the field of medicine and health." Hmm, is East Timor going to become the "Cuba" of the Pacific? With the likes of these East Timor folks, one can certainly expose that to be the case. "Hmm, is East Timor going to become the "Cuba" of the Pacific? With the likes of these East Timor folks, one can certainly expose that to be the case." Mah you are always too optimistic. Since gaining independence Timor Leste has been pushed by Western Governments, the World Bank/IMF and the Asian Development Bank to follow free market economic policies that benefit rich multinational corporations at the expense of the poor. The Cuban doctors are a bit of a side show. Timor Leste isn't socialist at all. Bloody commies. Fancy offering doctors and medical training. Typical of their callous and vicious methodology. You don't see capitalists doing that sort of thing, do you? The East Timorese should reject such help and proudly die horribly if they can't pay their own medical bills. "Mah you are always too optimistic. Since gaining independence Timor Leste has been pushed by Western Governments, the World Bank/IMF and the Asian Development Bank to follow free market economic policies that benefit rich multinational corporations at the expense of the poor. The Cuban doctors are a bit of a side show. Timor Leste isn't socialist at all." Look, whenever the likes of Fidel Castro or members of his Communist Party of Cuba start to align themselves with leaders around the globe. Doesn't matter if it's Hugo Chavez, Evo Morales, Daniel Ortega, Rafael Correa or whoever is in charge in East Timor, and these folks often promote similar rhetoric among themselves and began to consolidate power in a similar fashion, what sort of conclusion I should come? Now certainly, replace Communist Cuba with Nazi Germany during pre-WWII settings, and look at the Nazi/pro-German leaders that Hitler was backing. What sort of a conclusion can come from there? Why does it seem that Communist Cuba seems to get a free pass? Let's take another example. What if it were Benito Mussolini and his Fascist Party doing this instead of Fidel Castro and his Communist Party? What if Mussolini praised the "color-nationalist shirt" revolutions? Such as the Silver Shirts, the Blue Shirts, Green Shirts, etc.? What sort of society would be the end result when Mussolini's comrades come to power? Why does Fidel always get a free pass when it comes to Morales, Correa, Chavez, Ortega or his comrades in East Timor? Mah I think you're getting your shirts confused. It's the blue one with the flamingo on the pocket for Monday.....the pink one for Friday night down the disco.....and the white one for the synagogue.....oh, that one's got the barbecue sauce stain.....well, the green one with the Suzie Wong collar will have to do for this week. Alright ? You got it sorted ? Steve, knock off the harassment. You're nothing more than a blatant coward Steve if all you do on the Internet is harass people you don't like.